So, this is the New Year. Funny, it doesn't feel all that different to the old one. That's the thing about New Years that I don't get. People pin such high expectations on it, endow it with almost magical abilities to transform their lives. But at the end of the day, it's just day, like every other day. The ability to transform our lives lies within us, not in a day. Anyway, enough of my New Year's bah-humbugging. What have I got planned for 2015? Oo, lots. I started looking at my goals in November. Looked at the ones I missed in 2014, considered why I missed them. Looked at the ones I hit and gave myself a pat on the back, because I think it's important to see what you've achieved more than seeing what you missed. Considered the year ahead and what I want to achieve, and how I plan to do that. 1. Set a specific SMART goal: run a 5km fun run some time after August (specific, measurable, achievable, realistic and timely). These goals then get broken down into monthly chunks and then weekly chunks and then daily chunks. Every month I look at my yearly goals, consider what I need to achieve in the month. Then each week I look at that monthly chunk and work out what I need to do this week on a day-by-day basis. 2. Set a "list goal". I have a lot of projects I want to finish, for example a dozen or more quilts. A list goal is to focus on one project every month from the list that I keep with my goals. My lists grow as the year progresses, as new projects are added. Each month I choose the focus from my list, and decide how much I want to achieve, which depends on what stage that focus project is at, and what sort of a month I have ahead of me. Project lists include quilts, other sewing, holiday scrap booking, house renos, garden projects. I also have a list of people to write to (the goal being one per week); friends to catch up with (one per month) and similar activities. 3. Set a "percentage" habit. Habits are tricky goals to set, particularly for perfectionists. We feel if don't hit them 100% of time we're failing and (more often than not) might as well quit. This year I've come up with the percentage target. I want to develop a habit of taking my vitamins every day. The perfectionist me would say 365 out of 365 days is goal achieved, anything less is not. Reality me knows that just isn't going happen. I track every day that I take my vitamins. Each week I record how many days I 'hit'. Over three months I calculate my percentage hit. My habit goals are to hit 25% in the first three months, 50% in the second three months, 75% in the third three months, and 90% in the last three months. This gives a stretch goal, it gives me a target, and it keeps me realistic. 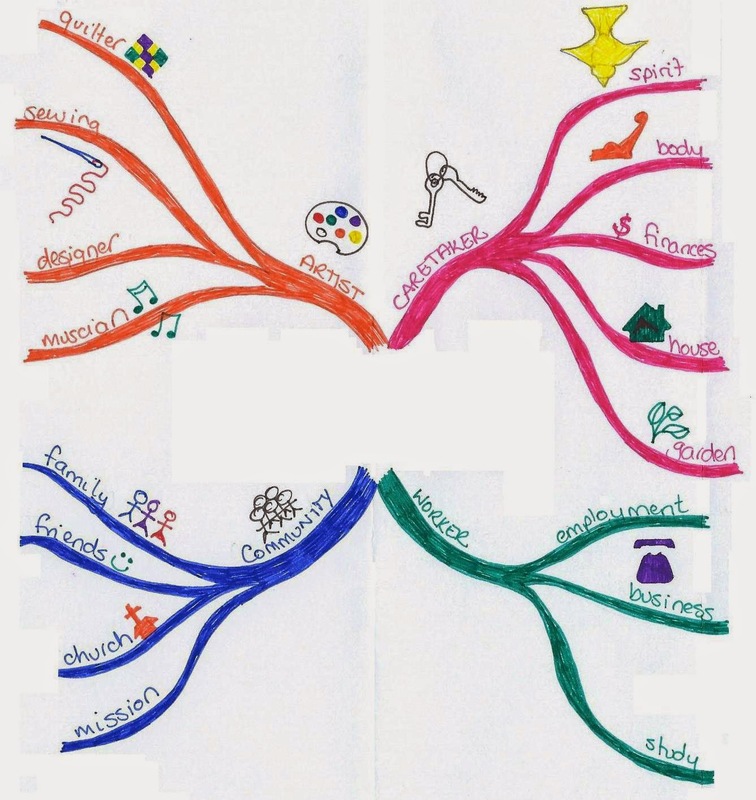 I mind-map my goals. This year, I've gone back to Stephen Covey's concept of 'roles'. I have four roles: artist, community, care-taker, worker. I have the year in the centre and a branch for each role. Each 'sub-role' is on a smaller branch. Under 'caretaker', for example, I have 'finances', 'spirit', 'body', 'house' and 'garden'. At the end of each sub-role I list my goals, whether SMART, list or habit. I keep this yearly mind-map in my diary. Once it's created, I scan it and remove the goals at the end of the branches and the year from centre. I print out the remaining basic structure and use it each month to set my targets for the month. In addition to setting goals for the year, I picked up an idea from a fellow quilter a couple of years ago, of assigning a word to the year. The word I've chosen for 2015 is "harmony". I want to develop as a musician, I want to find balance with all my pursuits, not focussing on any to the detriment of others, I want to develop strong, healthy relationships with people who are important to me. Using a tool I found on-line (http://www.wordle.net/create) I created a word cloud (also kept in my diary). 1. Write it down. Research shows if you write it down, you're more likely to hit it. 2. Review it. If you write it down and ignore it, you won't hit it. Review each month and each week, "What do I need to do in order to achieve this goal?" And then, the third important step is simply "Do it". this really resonates with me, Sue! thanks! and Happy New Year.